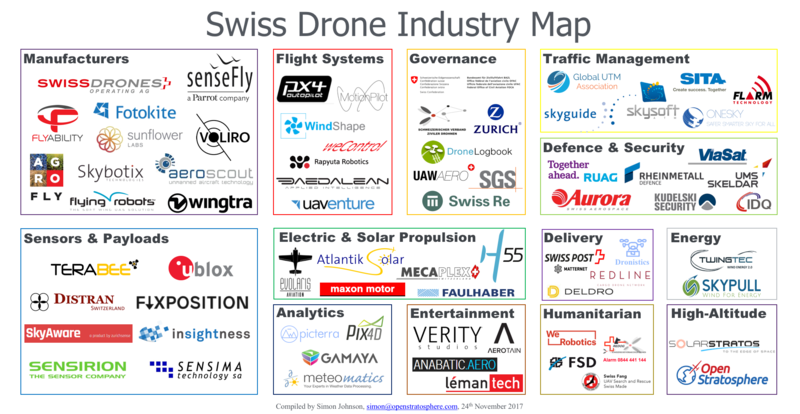 The Swiss Drone Industry Map above (click for larger image) is an attempt to list and group all companies and institutions in Switzerland that provide a product or service that makes commercial operations of Unmanned Aerial Vehicles possible. An entity can only appear in one box (i.e. main activity) and must be publicly promoting existing or future products and services. Swiss drone research centres, system integrators and pilot schools are not part of the map. Corrections, suggestions and new submissions are welcome! I’ve added all the links below so you can easily click through and learn more.